Chicken Wonton Soup is a quick, delicious and complete meal that can be ready in minutes. Ground chicken breast is mixed with delicious flavorings then easily transformed into dumplings can be made ahead so the soup is ready to go anytime. Wonton, which translates to ‘swallowing a cloud’, is a great way to describe how light these dumplings are. Ground chicken, green onions and flavorings are mixed together then wrapped in wonton wrappers then cooked in a delicious broth for a light and healthy soup. Napa cabbage is traditional in wonton soup, but I like to use bok choy because it gets greener when it cooks which makes this soup very eye-catching and bright. The key to making the wonton assembly go quickly is to have everything lined up around your work area. Wonton wrappers, the chicken filling and a small bowl of water. The wontons come together very quickly once you get the hang of making them. I like to lay out as many wonton wrappers that will fit on my board. In this case I was making them in batches of 6. I find that ground chicken is readily available in most grocery stores. If you cannot find it, add 1 pound of boneless skinless chicken breast to a food processor and pulse 3-4 times until ground. 1. Spoon a teaspoon of chicken mixture into the center of a wonton wrapper. 3. Fold the bottom left corner over the filling to meet the top right corner (this can be reversed if you are left handed). 4. Pinch so all the air is out and the wonton wrapper is tight around the filling. 5. Then take the right and left corners and bring them around to meet at the bottom, wet one corner to help them stick. This recipe makes a lot of wontons, you can freeze whatever you don’t use. 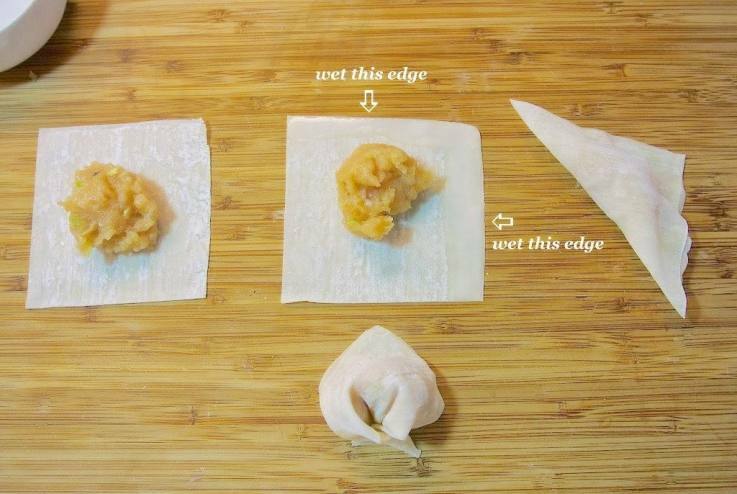 To freeze, put the unused wontons in a zippered bag, in a single layer. Put the bag flat in the freezer and then just pull out however many you need, when you need them. Pour the leftover soup into a container with a tight fitting lid and freeze. To defrost, place in the fridge overnight then reheat in the microwave or a pan on the stovetop and enjoy! 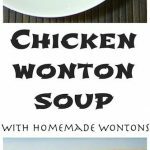 If you’ve tried this Chicken Wonton Soup or any other recipe on the blog then don’t forget to rate the recipe and let me know how it turned out in the comments below. I love to hear from my readers! 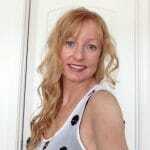 You can also FOLLOW ME on FACEBOOK, TWITTER, INSTAGRAMand PINTEREST to see daily recipe updates. Ground chicken breast is mixed with delicious flavorings then easily transformed into dumplings can be made ahead so the soup is ready to go anytime. To a food processor, add the chicken, chopped green onion, soy sauce, rice wine, ginger, sugar and pepper. Pulse until the meat is ground and comes together in a ball. Transfer to a bowl and mix well. 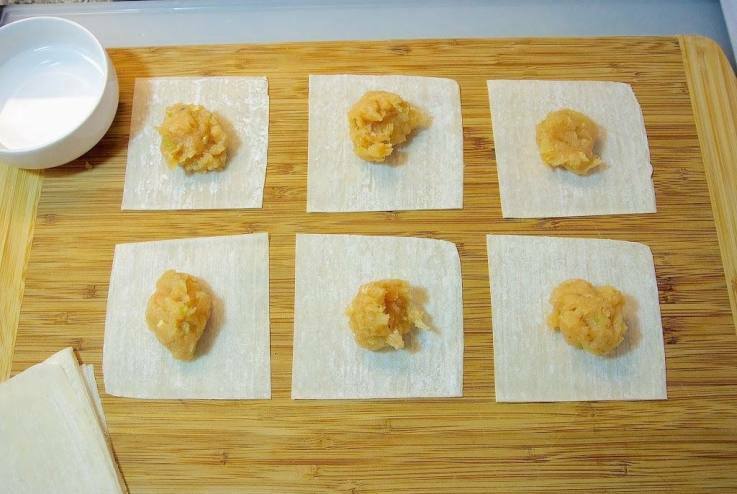 On a clean surface or cutting board, arrange the wonton wrappers. Have a small bowl of water nearby. Spoon 1/2 teaspoon of of the chicken mixture into the center of each wonton. Wet a finger in the water and wet 2 edges of the wonton. Fold the opposite corner to meet the wet edge to make a triangle. With the wet corner facing away from you, bring the left and right corners around to meet at the bottom, press together. Use water to help them stick. 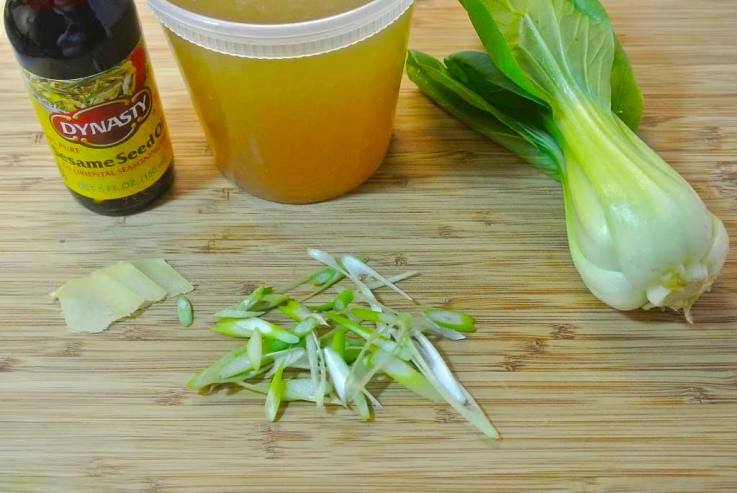 Cook the the bok choy for 2 minutes in boiling water, remove and set aside. Drain the water. In the same saucepan, add the chicken broth, ginger, sugar and pepper and simmer. Add wonton and simmer for 3 minutes. Add the bok choy back into the soup. Serve and garnish with green onions and a splash of sesame oil. Delicious! I used pork mince and apple cider vinegar because I didn’t have any rice vinegar. My blenders on the blitz so I hand mixed. Really tasty receipe, thanks! I’m so glad you liked them and I like making them with pork sometimes too. Thank you for the great feedback. I made this for the weekend and it was delicious. I have the leftovers with me for lunch today at work and can’t wait. Thanks for a delicious and easy recipe. Can you tell me how many quarts this makes, or how much a serving size is? Thanks! Hi Roxie, the recipe yields almost 2 quarts. Thanks for stopping by. Can you make the wontons ahead and freeze them for a day when you NEED the soup? I love soup but it’s only me and I’d never be able to eat all of them at one time! Hi Debbie, this is actually a great idea! I think you could probably cook them right from frozen, just cook them longer to make sure the chicken is cooked. Thanks for stopping by. You said to boil the Bok Choy in water for 2 minutes & then drain. But nothing is ever said about what to do with the Bok Choy afterwards? Please clarify. Thanks. Hi Tamara, the bok choy is added to the soup after cooking the wontons. Thank you for stopping by. You cook the chicken before the food processor, correct? Hello Ang, no the chicken goes in the food processor uncooked, mixed with the other ingredients then gets wrapped in the wonton and they get cooked in the soup. I hope this helps. Hello Nancy. Many grocery stores carry ground chicken now so you don’t need a food processor, just chop the green onions finely and mix well with the ground meat and other ingredients. Please come back and let me know who you like it if you make the recipe. I almost empty My veg. Bin when I make my wongton soup. Just make sure your Veg’s are cut small. The filling will freeze well. I usually make the left overs into egg rolls love it all. Yum so good. Wow, your soup looks fantastic. Very exotic! Comfort food in a bowl! Love it! Pinned. This is the soup I order when i go to a Chinese restaurant! Your pics look so beautiful! 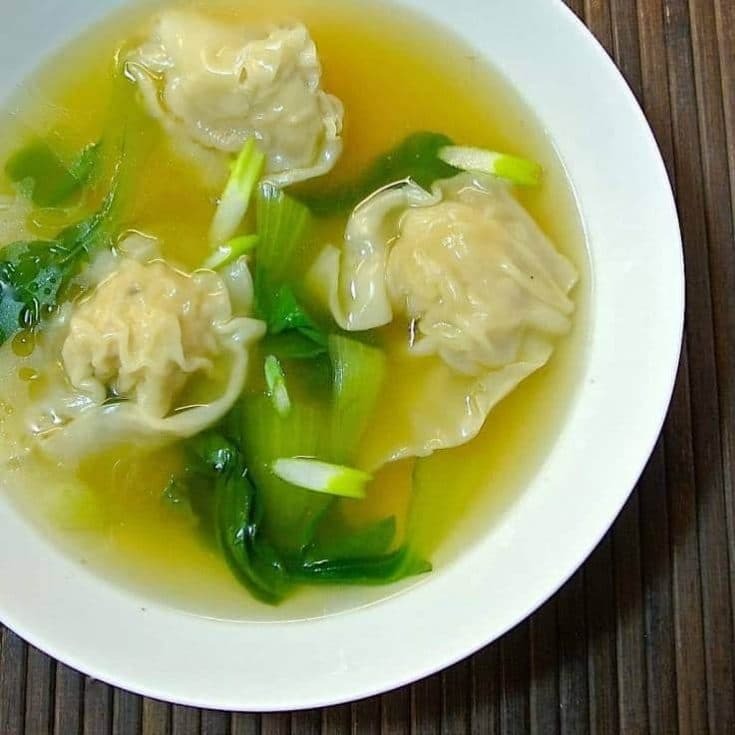 I think I had hit the mother load of recipes, I simply adore wonton soup and would devour this entire recipe in no time flat. This looks delicious! Thanks for the tutorial on them as well. I love wonton soup, and need to try making it at home. Thanks for the recipe! Yum! Mmmm, those wontons look so good. Great soup! This recipe is a keeper! Nice tutorial and such great photos. I want to make this today. Won Ton soup has been on my bucket list a while now! I have some wonton skins in my fridge just begging for this soup. YUM! This looks like the perfect soup to eat if you were feeling unwell. Janette, I love this simple soup and the won tons are perfectly done.